For many families, a big trip to Disneyland is a must-do family vacation. But, as you wrangle accommodations and a growing list of people interested in coming along for a Disney adventure, your costs and your stress can easily rise. Add in worries about LA traffic and navigating the parks themselves, and your vacation may not be much of a vacation for you. Whether you’re just starting to plan or are realizing what a big job it will be, here are a few tips to reduce hassle and stress when heading to Disneyland. Hiring a car service for your trip is a great idea for many reasons. First, you avoid navigating Southern California freeways and traffic — which automatically reduces stress levels for most out-of-town visitors. You can also choose from a wider variety of Southern California airports to save money and find the right flights for everyone. And the flat rate for a contracted service prevents you from overpaying for ride sharing, tolls, or taxis. Finally, you can order a vehicle (or vehicles) big enough to keep your whole group contained and organized. Unless your group all has the same interests and the same experience level with the Disneyland parks, you should consider breaking up into a few smaller groups. Doing this before you enter the park helps keep attitudes and morale up while ensuring more people get to do what they really want. Assigning responsibility for each other also prevents stragglers from getting lost in the crowds. Groups could be arranged by family, age, or by interests. Got a bunch of teenagers who just want to go on roller coasters? Put them together, perhaps with an adventurous adult or two, and send them off. Have a family with lots of little ones? Give the parents a break by matching them with a more experienced Disney-goer who can help keep things running smoothly. Want a quieter, relaxed day? Form a window shopping and show-attending group. Disneyland is a bit overwhelming to the new traveler, and little good will come from trying to make a group plan for the day after you’ve gone through the front gates. Your game plan should be hammered out well before the big day. Familiarize yourself with Disneyland maps, ride descriptions, and eating choices. Learn the rules for various rides or shows. Find out everyone’s prior experience level with Disneyland. And discuss everyone’s priorities so that you can make a plan that includes them. A game plan doesn’t need to be incredibly detailed, but it should include basics — like the intended route around the park, which must-see ride or attractions to do first, where to meet for food, and what FASTPASS tickets to get. Before heading off for the day, go over designated meeting points. The whole group should have a stationary, easy-to-find meeting point in case someone gets lost or tires out. Because of its central location and large size, meeting in front of Sleeping Beauty’s castle is a popular choice. 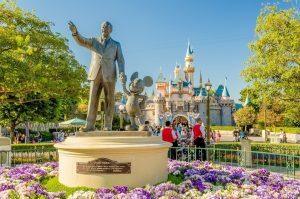 There are a lot of great spots to choose, though, like the statue of Walt Disney, the Mickey Mouse landscape at the front gates, or the entrance to Paradise Pier in California Adventure. Decide what times everyone will meet back together and where. Want to take a group photo? Choose your landmark spots and take the pictures at the beginning of the day before the park gets too chaotic. Decide if you’ll meet for lunch or for a particular ride. Many groups like to gather back together to do the last ride of the day — for a great sense of closure. Start planning your Disneyland trip by checking out the fleet of available vehicles at In Style Transportation. As Southern California transport and travel experts, we can help you save money, time, and worry no matter what your plans are. Call today for more information.